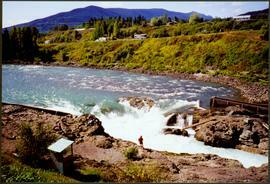 "Report on the Fisheries Problems Created by the Development of Power in the Nechako-Kemano-Nanika River Systems - Supplement No. 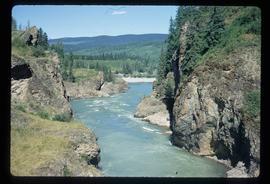 1: Temperature Changes in the Nechako River and Their Effects on the Salmon Populations"
Photograph depicts bare mountain ridges near the Bulkley River and 55th parallel. 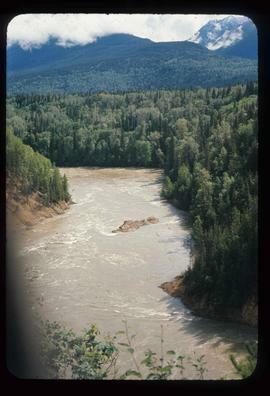 Image depicts the Bulkley River. 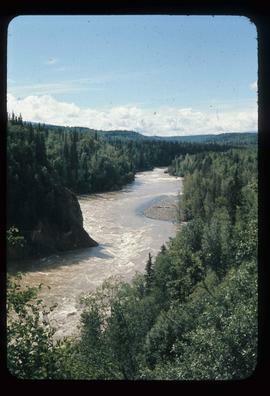 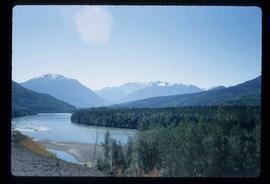 Image depicts the Bulkley River near Moricetown, B.C. 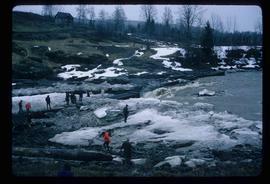 Image depicts numerous unknown individuals standing by the Bulkley River near Moricetown, B.C. 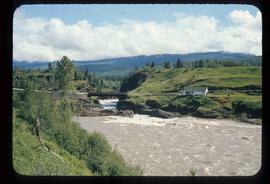 Image depicts a small group of people standing near the Bulkley River at Moricetown, B.C. 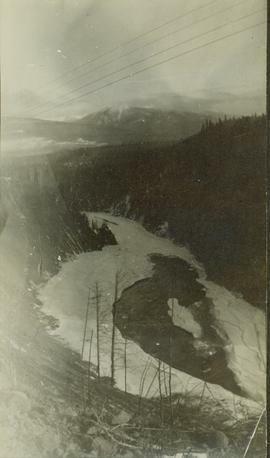 Photograph depicts a view looking down on the Bulkley River, forested banks on both sides of the river, high mountains in the distance. 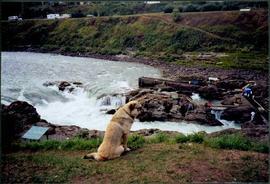 Photograph depicts dog seated on grass in foreground. 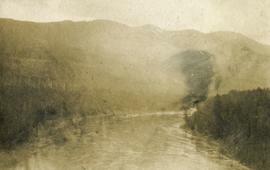 Unidentified individuals visible below with fishing nets in waterfall area at Moricetown Canyon. 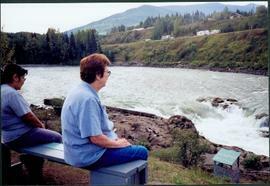 Photograph depicts Moran seated to right of woman on bench in foreground. 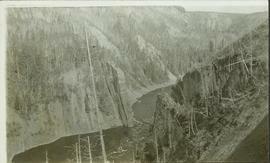 Waterfall area at Moricetown Canyon can be seen below, behind booth labeled "MONITER BOOTH". 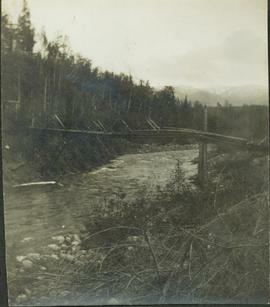 Highway and houses visible on opposite shore in background. 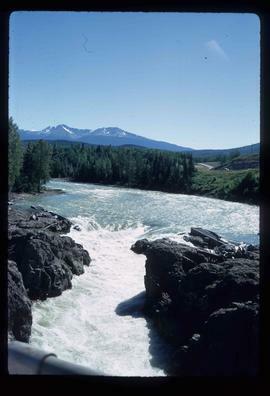 Image depicts the Bulkley River running through Moricetown Canyon. 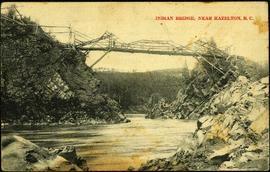 Railway Bridge at Hazelton, B.C. 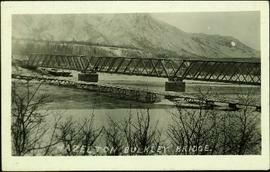 Partially visible handwritten annotation on verso: "...Bulkley River crossing taken from the door (?) 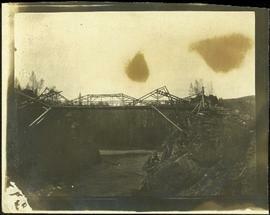 yard of Ned's camp, Rec (?) 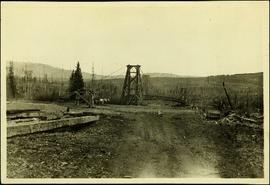 32". 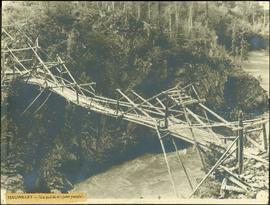 Photo consists of a work crew either crossing or working on this bridge. 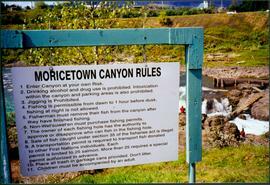 Photograph depicts sign in foreground outlining rules and restrictions for behaviour at Moricetown Canyon. 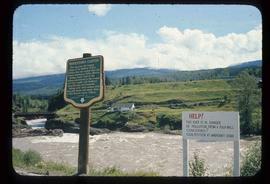 Traditional fishing territory visible behind sign at waterfall in the Bulkley River, B.C. 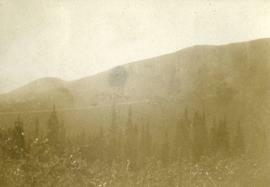 Highway and buildings can be seen in background. 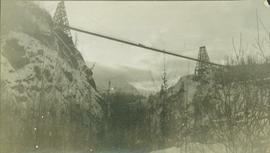 Photograph depicts an unidentified individual standing on cliff above waterfall at Bulkley River, B.C. 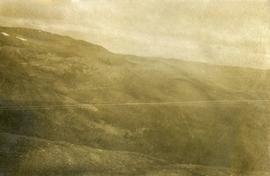 Fishing territory visible below; highway, buildings, and hills visible in background. 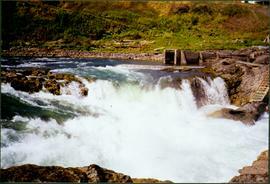 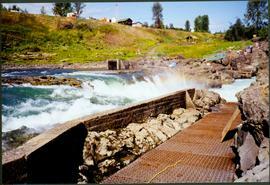 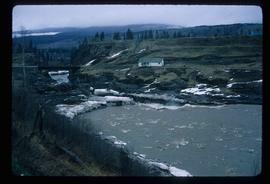 Photograph depicts fishing territory at waterfall rapids in Bulkley River, B.C. 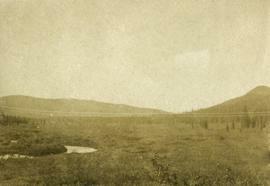 Highway and buildings on opposite shore in background. 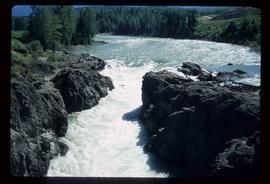 Photograph depicts white rapids at bottom of waterfall in Bulkley River, B.C. 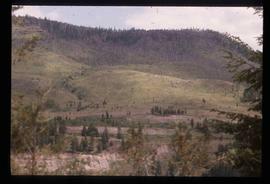 Fishing territory visible on far right; hill on opposite shore in background.